Lauri's Stories: Booty, Booty, Booty! I Got Writing Booty! I'm doing the booty dance! Booty, booty, boot-y! Hey! Booty, booty, boot-y! Hey! A New Bookshelf which holds a Motherload of Books. When we set sail to the East Coast, I scuppered my book collection overboard and became a loyal library card holder. But, arrr, a writer needs a bookshelf. Handsome Journals Including one with color-coded sections! Aye, I wet me britches a little when I opened that gift. 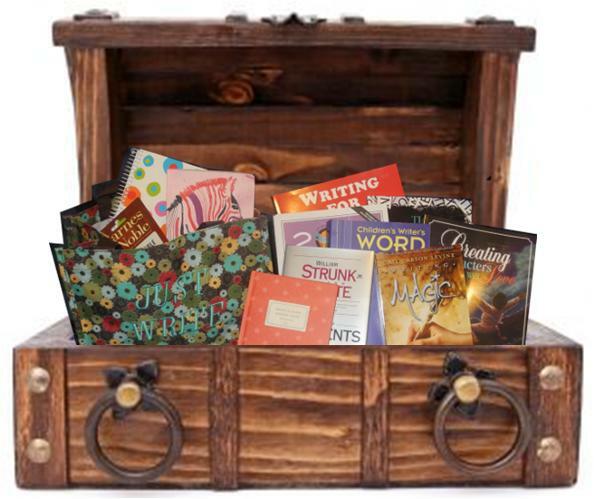 "Just Write" Tote for Books and Journals Avast! I see you eyeing my booty you scallywag stepchild son of a manatee! Avert ye eyes! Net, I am very blessed, I will be reading every night for a century, and I love pirates. But pray tell, what writing booty hath ye received? I can't tell if I'm jealous or inspired! I love your booty and I totally mean that in a Pirating way! I treated myself to a copy of Stephen King's, On Writing, which I have actually started reading, thank you very much, and a new journal. Very pretty with leather! Ummm, and I think I must say that you've missed your calling as a pirate!!!!! You struck gold!!! 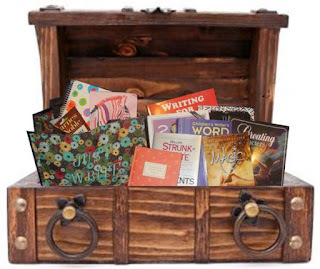 That's a writer's dream package right there. My birthday's coming up so I'm going to add your gifts to my wish list! Here's the books I got: Creating Characters Children Will Love, Writing for Children and Teens, by Cynthea Liu (maybe I'll get a green light next year in RLGL! ), The Emotion Thesaurus (this makes me salivate every time I open it), Children's Writer Word Book, Writing Magic, The Elements of Style, and the 2013 Children's Writer's and Illustrator's Market (which is awesome bc I only bought myself a cheap, used 2010 edition - so now I am up to date!). Whoo! I feel the booty dance coming on! I have a total illustrated picture in my brain of you doing your Booty Dance, Lauri. And the gifts? How inspiring. We only know each other virtually and yet you know me so completely! And the gifts? Whew, I have some reading to do! Seriously, though, you got some major goodies! I took in a haul of Amazon gift cards ... over $100 worth, ha-ha. The terrible thing for me is, the more I have, the less I'm willing to spend it, because as the amount goes down I'm afraid I'll realize I wasted it on something when there was something AWESOME I could have purchased! I need to use them to get some booty-licious bookie things! Nice! A hondo of Amazon is a lot of Amazon. Spend it. Spend it now! Otherwise, you'll end up ordering toilet paper on Amazon one day (hey they have everything!) and you're money will be gone and you won't even have enjoyed it. Or at least put a plan in place. There are lots of used books in great condition. You can buy one per month all year! You got boot-y, boot-y! Awesome! The kids/I got a tonne of picture books and poetry books, in book heaven too! Arr, my wee lads really hauled in the picture book booty! Luckily they are happy to share with me. It helps that they can't read yet. I go crazy for new journals and notebooks too! Avast, ye be a cyber pirate! Nice virtual booty. Wow! I just got a broken toe and a lot of family members asking me "So! Are you writing another book?" Good times. No rest for the weary! Well, your book did come out way back LAST year, so I suppose you are due for another. I'll read it, if you write it!